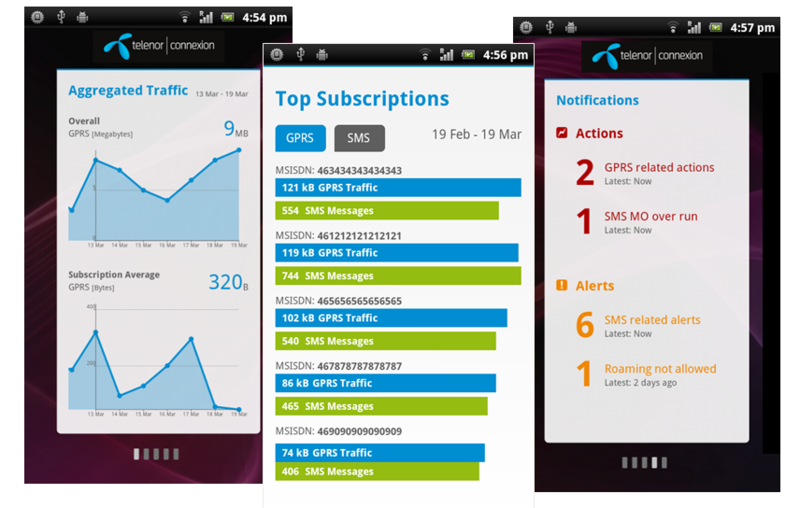 Telenor Connexion provides customers with the first mobile app for instant management of connected devices. With the new M2M Dashboard mobile app customers can access data usage, alarms and subscription details anytime anywhere. With the new M2M Dashboard mobile app customers can access data usage, alarms and subscription details anytime anywhere. Telenor Connexion, the M2M pioneer and leading enabler of connected services, today unveils the first-ever mobile app for instant management of connected devices. The M2M Dashboard is an app for Android smartphones that provides customers with an overview of data usage, alarms, as well as details on subscriptions in the customer’s M2M solution. “The new M2M Dashboard mobile phone app is an additional benefit for subcription monitoring that we are happy to offer our customers. Telenor Connexion’s customers are already today using our web-based Service Portal to analyze and improve device and traffic behavior for cost-efficiency and streamlining of their processes. The mobile app is a complement to the Service Portal allowing access to the data anytime and anywhere”, says Rickard Widerberg, Head of Product Marketing at Telenor Connexion.